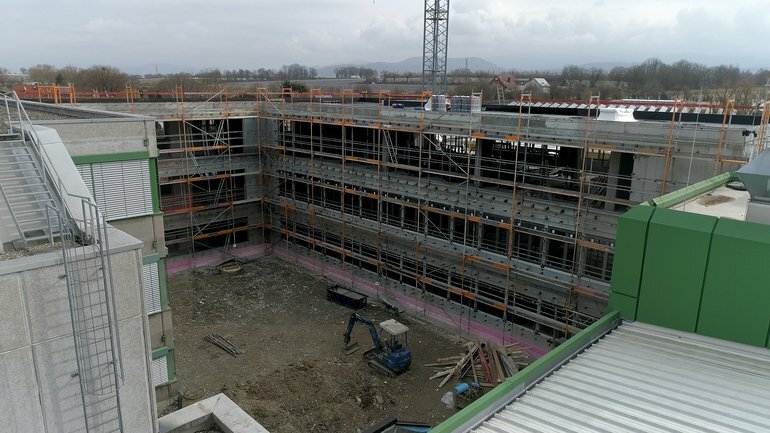 Numerous guests gathered in the district of Munzingen, Freiburg for the topping-out ceremony on March 15, 2019. Together with the construction companies and architects carrying out the project, the staff and management of KNF Neuberger GmbH celebrated the end of the second stage of construction for the new building, which will house administrative offices and additional production areas. With the new building the company’s production areas will total 5,000 m2. KNF wants to make use of its new space to exploit the possibilities of Industry 4.0 more systematically. The work spaces will be structured based on the latest lean management approaches and kitted out with state-of-the-art technology. This will allow the specialist in pump manufacturing technology to work even more ergonomically and efficiently. The family-owned Freiburg company has invested more than 5 million euros in the expansion of its location in Freiburg-Munzingen. The existing administrative building is set to be renovated following the completion of the new build.